Someone once asked Luther what God was doing before He created the world. Luther is reported to have answered, “Creating hell for people who ask such stupid questions.” God was not bored. He doesn’t “do things” except to bless us. The cupboards of heaven are not stuffed with jigsaw puzzles or stamp books for the Almighty to kill time on a particularly slow millennium. The good Lord isn’t sitting in heaven, wringing His hands hopefully, as He waits to see if people will show Him the proper respect. He isn’t like a movie critic during the worship service, checking to see if we are doing things properly. He’s God. He will be just fine whether we thank, praise, serve, and obey Him or not. Don’t worry about God. When we talk about doing good works, we must never believe that God benefits from them. All talk of God is about what God does for us, not what we do for God. What about the Ten Commandments? Don’t they tell us what to do for God? The word commandment is unfortunate. We should call them the ten statements or the ten principles or, better, the ten descriptions of God’s children. They aren’t even imperative. They are descriptions of those people whom God controls. God says to His people, “You will not kill. You will not commit adultery. You will not steal.” He’s describing us. Remember when you were a kid and your dad was called into the principal’s office to discuss your behavior? That happened to me. I was accused of showing disrespect to a teacher. It was a false accusation. She had me confused with another guy. My father said, “My son is not disrespectful. He will not show disrespect.” Grammatically, that’s the same as “You will not kill.” Dad did not give me an order. He described me. I suppose someone might think that this understanding of the Ten Commandments gets us off the hook. The opposite is true. What if I had, in fact, been disrespectful? Imagine if my dad’s description of me were not true. I would have made him a liar. His statement would have elicited more anguished repentance than all the imperatives in the world. Imperatives don’t work. Descriptions do. The Ten Commandments describe us. Luther’s Large Catechism instructs us. The Ten Commandments (I will call them the Ten Commandments because of tradition) are given so we can know how God blesses us and how He uses us to bless others. They are divided into two tables. It is often said that the first three tell how we are to love God and the next seven tell us how to serve other people. But even the first three do not have God as the beneficiary. Rather, they tell us of the manner in which God blesses us with grace for eternity. The next seven commandments tell us how God uses His children to bless others for this life. Learn the Ten Commandments from Luther. He summarizes the first three, “Therefore you must constantly keep God’s Word in your heart, on your lips, and in your ears.” The First Commandment is to believe, the Second to speak, and the Third to listen. So we are blessed by the commandments. In the First, God “makes no greater demand than heartfelt trust in him for every good thing, so that we walk straight ahead on the right path using all of God’s gifts.” The Second Commandment requires that such confidence be spoken as we “honor God’s name and keep it constantly upon (our) lips in all circumstances and experiences, for. . . . the lips (honor God) by confession” so others might believe. The Third Commandment tells us to place the Word of God onto our ears. So we take time off on a day of rest “to attend worship services [literally ‘divine service’], that is, so that they may assemble to hear and discuss God’s Word and then to offer praise, song, and prayer to God.” The singing and praying is not for the benefit of God. It benefits others. And the learning of the Word is done not to flatter God but “for the sake of the young people” or “for the sake of the whole community” of the church. When we have followed the first three commandments, God is not the beneficiary—we are, along with our children, the church, and anyone who hears our confession. The second table of the Law tells us how to serve our neighbor in this life and for this life. We respect parents (Fourth Commandment), preserve life (Fifth Commandment), enjoy marriage (Sixth Commandment), protect property (Seventh Commandment), guard reputation (Eighth Commandment), and we do so joyfully (Ninth and Tenth Commandments). God is not benefited by our obedience to the Ten Commandments. God does not feel better when I get up and change my child in the middle of the night. He does not need the commandments. We do. God especially does not need my good works in the area of worship. Too often we picture God as the beneficiary of our worship as if He is impressed with the quality of the musical performance in church. God is even depicted as somehow saddened if our whole hearts are not focused into the manner in which we worship. God existed from eternity without my prayers or my music. He’ll do just fine. The Divine Service is intended to bless people, to bring the word of forgiveness to them, whatever role I might play. Large Catechism, “Ten Commandments,” 100 (K–W, 400). Large Catechism, “Ten Commandments,” 47 (K–W, 392). Large Catechism, “Ten Commandments,” 70 (K–W, 395). Large Catechism, “Ten Commandments,” 84 (K–W, 397). Large Catechism, “Ten Commandments,” 89 (K–W, 398). 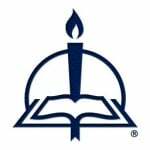 From The Fire and the Staff: Lutheran Theology in Practice, pages 203–5 © 2005 Klemet I. Preus, published by Concordia Publishing House. All rights reserved. 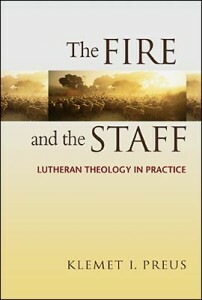 To order The Fire and the Staff, please contact CPH at 800-325-3040 or visit www.cph.org.